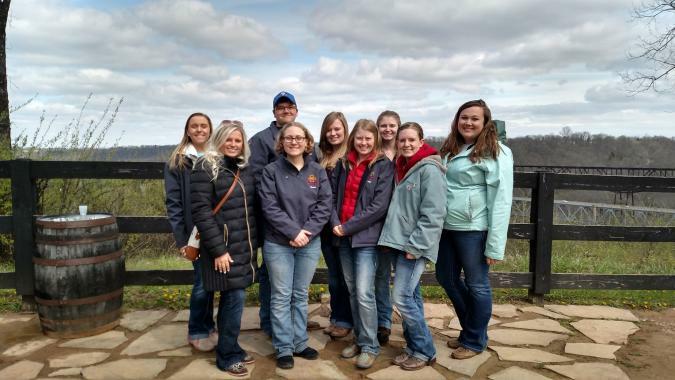 The Iowa State University Intercollegiate Meat Judging Team recently returned from their last contest for the semester – the Southeastern. This two-day contest is hosted by The Ohio State University and the University of Kentucky. The team finished in sixth and eighth places with 19 teams competing. Division results include: Beef Grading – 5 th and 9 th; Beef Judging – 4 th and 7 th; Overall Beef – 4 th and 8 th; Lamb Judging – 2 nd and 4 th; Pork Judging – 3 rd and 9 th; Specifications – 7 th and 8 th; Reasons – 4 th and 6 th; and Total Placings – 5 th and 8 th. Individuals receiving honors include: Georgia Androy (Malvern) – Lamb Judging 8 th and Total Placing 10 th; Kaitlyn Boyer (Weldon) – Overall Individual in Contest 10 th; Shelby Deaton (Baxter) – Reasons 6 th, Pork Judging 8 th, and Lamb Judging 10 th; Hannah Engle (Ames) – Lamb Judging 7 th, Reasons 10 th , and Total Placings 7 th,; Kaitlyn Olson (Luana) – Lamb Judging 5 th; Jennifer Vander Lee (Hartley) – Reasons 5 th, Beef Judging 6 th, and Lamb Judging 9 th. Team members also include Darin Koch (Osage) and Macy Leonard (Newton). The team is coached by Dr. Sherry Olsen and Taylor Wulf (Hudson). Contests will resume in the fall semester with the Hormel National Barrow Show, the Elanco Animal Health American Royal, the Cargill High Plains, and The International National Championship.